Culture: Melons need rich, fertile, and well-drained soil. They require high temperatures during the growing season and do best in warm interior valleys. Sow melon seeds when soil temperatures exceed 75°F; set out transplants only after all danger of frost has passed. Vines have separate male and female flowers, and bees are required for pollination. Avoid using insecticides or bees may be harmed. Male blooms form first and do not set fruit; do not be concerned when male flowers fall off. There are approximately 35-45 days from pollination to harvest, depending upon the type of melon. Apply water so the soil is evenly moist and give deep soakings until the fruits reach their mature size. 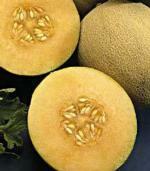 Then reduce watering when the first melon is ripe to concentrate flavors and eliminate cracking. Melons are relatives of cucumbers, squash, pumpkins, and water-melon, all of which are known as the cucurbits. They suffer from similar pests and diseases. Varieties: The melon varieties listed below were grown in the Fair Oaks Horticulture Center Vegetable Demonstration Area the spring and summer of 2007. Seeds were sown in 4-inch peat pots on a staggered schedule beginning April 17. Propagation (heating) mats and grow lights aided in the rapid germination of the plants (average germination time was 4 days). Melons were transplanted into the ground when there were 2-3 true leaves present beginning on May 17. They were trained up concrete reinforcing wire/channel fencing trellises to allow more plants within a confined space. Plants were fertilized with kelp when the first true leaves emerged; they were also fertilized with fish emulsion and kelp when the vines began to run and again at fruit set. * Days to Maturity – The approximate time between seed sowing and the appearance of ripe fruit. Seed Sources – W. Atlee Burpee Company, Territorial Seed Company, and Seed Savers Exchange. To simplify information, trade names or products and company names have been used. No endorsement of named products or companies is intended, nor is criticism implied of similar products or companies that are not mentioned. All of the melon plants grown in 2007 grew quite vigorously, and with the exception of the ‘Crane’ Crenshaw, none experienced any disease. The ‘Crane’ developed leaf spots on all three plants grown. Toward the end of August, all plants became infested by aphids, so all plants were removed from the garden to make room for planting a winter garden. All of the melon varieties took longer for the first harvest than indicated on the seed packets. Spring weather was fairly warm, and typical hot summer temperatures occurred, so it is unknown why the melon plants took so long to produce fruit. Only 4 of the 6 melon varieties were ripe by Harvest Day on August 4. The varieties tasted at Harvest Day (‘Ambrosia’, ‘Arava’, ‘Crème de la Crème’, and ‘Honey Girl’) all were tested for sweetness using a Brix meter, and the results of the Brix test is listed following each variety. (See information below to learn about Brix). ‘Ambrosia’ Cantaloupe – A hybrid cantaloupe with peach-colored flesh. The melons average 4-5 pounds and are approximately 6 inches across with a heavy netting. The vines are tolerant of powdery mildew. The seed packet indicated that melons are ready to harvest in about 84 days from sowing (our first harvest was in 92 days). When ripe, fruit “slips” (detaches easily from the stem when lifted). This melon was clearly the best producer (12 melons from 3 plants). The rather soft textured flesh of this hybrid cantaloupe was preferred by some, as was its old-fashioned flavor. Brix = 9.5 °Bx. ‘Honey Girl Hybrid’ Charentais–ACharentais (pronounced:sha-rahn-TAY) melon bred for American gardens. Firm, deep orange flesh has a delicate flavor. Fruits average 2 pounds. Thin, greenish-gray skin with light netting protects the tender fruit. Ready to harvest in about 75 days from sowing (although our first harvest took 89 days). Fruit is ripe when the skin takes on a tan/golden color and has a strong sweet aroma. There may be a slight split at the bottom (blossom end). 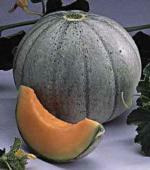 The melon will be overripe if the rind turns orange, has a strong musky smell, or the fruit “slips” from the vine. The melons that was tasted during the morning of Harvest Day were extremely flavorful and sweet; however, subsequent melons did not have the intense flavor or sweetness (some tasters thought they were bland). The melons were a bit tricky to determine when ripe, as several melons were actually overripe when it appeared that they were just beginning to ripen. Melons that had splits at the bottom tended to attract ants. Seven (7) melons were harvested from 3 plants. Brix = 11 °Bx. ‘Crème de la Crème Hybrid’ Ananas– Not a cantaloupe, honeydew, or muskmelon, but rather it is classified as animprovedAnanas variety. The skin is orange-yellow and lightly netted. Inside, the fruit is creamy white, marbled with pale orange. It is very fragrant, sweet, and slightly spicy. The melons average 5-7 pounds and are approximately 7-8 inches across. Ready to harvest in about 75 days from sowing (our harvest began in 85 days). When ripe, the fruit “slips” (detaches easily from the stem when lifted). Some Harvest Day tasters described this melon as tasting somewhat of bananas, but most could not identify the unusual flavor. “Ananas” apparently means “pineapple” in French and Spanish, but none of the tasters found that it tasted like pineapple (only the color, perhaps). The flavor was consistently good and sweet. 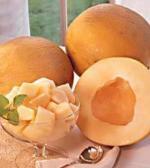 The fruit looked like small, round cantaloupes, and the melons slip like cantaloupe when ripe. It was preferred by many Harvest Day tasters. Three (3) plants produced 7 melons. Brix = 10 °Bx. ‘Arava’ Galia–ThisGalia-type hybrid melon has aromatic green flesh. Fruits are approximately 6 inches in diameter, round, yellow netted, and weight approximately 2-3 pounds. Ready to harvest in about 75 days from sowing (our first harvest was 87 days). When ripe, fruit does not ‘slip”. When the melon smells ripe, it is. Press the bottom (blossom) end slightly to release aroma. This melon was very popular with Harvest Day tasters. The flavor was reminiscent of a really sweet honeydew. It was fairly close to ‘Crème de la Crème’ in popularity among tasters. ‘Arava’ was a fairly good producer (10 melons harvested from 3 plants). Brix = 13.5 °Bx. ‘Crane’ Crenshaw – This Crenshaw-type melon was introduced in the 1920’s by Oliver Crane whose family farmed for six generations near Santa Rosa, California. The teardrop-shaped melons with light orange flesh average 3-5 pounds. Unusual dark green freckles dot the lighter green skin. The smooth-skinned melon developed rough netting, similar to a cantaloupe, as it matured. Ready to harvest in about 75-85 days from sowing (ours took 106 days before the first melon was harvested). Harvest when the blossom end begins to soften and the freckles turn orange. The melon does not ‘slip” from the vine when ripe like a cantaloupe and must be cut from the vine. Foliage on all three plants that were grown for our demonstration developed leaf spots. There was no ripe fruit by Harvest Day (August 4); however, three days later (August 7), the melons finally began to ripen (approximately 26 days later than the average harvest date). Of the 8 melons harvested, only 2 were flavorful, and when fully ripe, the flavor was really scrumptious. It was very difficult to hit the peak of ripeness, since all of the harvested melons exhibited the same characteristics: blossom end began to soften and the freckles turned from green to orange. Since only one-quarter of harvested melons had good flavor, and the melons took an extremely long time to ripen, this melon probably will not be grown again. ‘Bartlett’ Honeydew – A hybrid golden honeydew melon with firm, white flesh that tastes like a cross between an apple and a pear. The melons average 7-8 pounds. Ready to harvest in about 90 days from sowing (this estimate was way off, as our first harvest took 145 days). 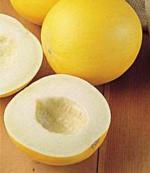 Large, round (like a bowling ball) melon turned from light green to cream to bright gold when ripe. The skin also became waxy, but the blossom end never had a ripe, fruity smell that was supposed to have occurred when ripe. Six (6) melons were harvested after Harvest Day beginning on August 20 (55 days later than the average harvest date). All of the melons had good flavor, but they took an extremely long time to ripen. The firm white flesh was very sweet, and the melons were huge. 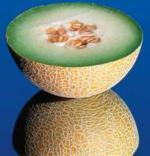 Because honeydew melons take a very long time to ripen, this variety probably will not be grown again. Degrees Brix (symbol °Bx) is a measurement of the mass ratio of dissolved sucrose to water in a liquid. It is measured with a saccharimeter that measures specific gravity of a liquid or more easily with a refractometer. A 25 °Bx solution is 25% (w/w), with 25 grams of sucrose sugar per 100 grams of liquid. Or, to put it another way, there are 25 grams of sucrose sugar and 75 grams of water in the 100 grams of solution. Brix is used in the food industry for measuring the approximate amount of sugars in fruits, vegetables, juices, wine, soft drinks and in the sugar manufacturing industry. For fruit juices, one degree Brix is about 1-2% sugar by weight. This usually correlates well with perceived sweetness. Since Brix is related to the concentration of dissolved solids (mostly sucrose) in a fluid, it is therefore related to the specific gravity of the liquid. Because the specific gravity of sucrose solutions is well known, it can also be measured by refractometers. Modern Brix meters are digital refractometers that calculate the Brix value based on refractive index. These meters are typically portable, splashproof, and very simple to use, so that they can be operated by anybody directly on location. More and more often, Brix is measured to determine ideal harvesting times of fruit and vegetables so that produce arrives at the consumers in a perfect state or is ideal for subsequent processing steps such as winemaking. Written by UC Master Gardener Gail Pothour, July 2007. Edited by Judy McClure, UC Master Gardener Coordinator.